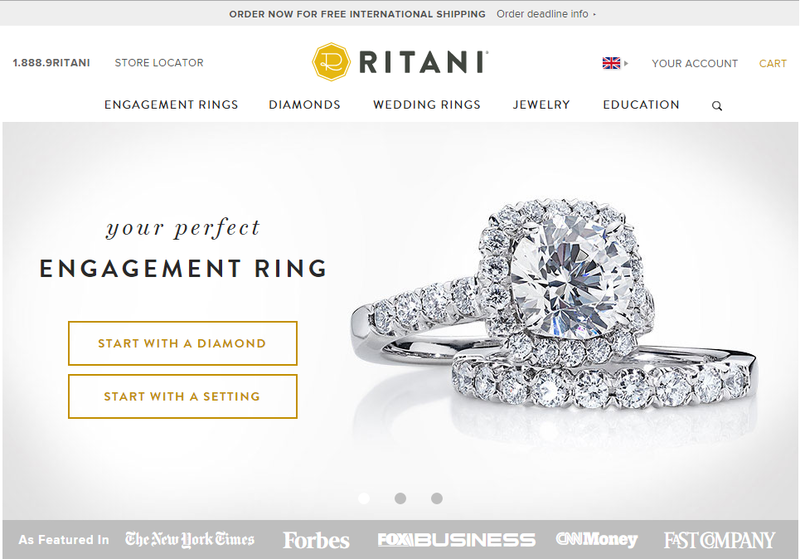 Ritani are one of the major players in the online diamond market which is why I had to write this Ritani Review. Their jewelry is sold through a range of carefully selected partner stores. I’ve seen their jewelry in-store but have never ventured into their e-commerce side. Brilliant Rewards: Purchase a Ritani Engagement Ring and unlock a portfolio of exclusive offers for your entire wedding journey. Free Shipping: Ritani offers complimentary shipping on all jewelry shipped in the U.S. via FedEx® Priority Overnight and to Canada via FedEx® Express Shipping. So would the online shopping experience offered by Ritani live up to the hype? Read on to find out….. If you have read our other reviews you will know that I believe the only way to properly gauge a company’s pricing policy is to do live comparisons with their competitors. 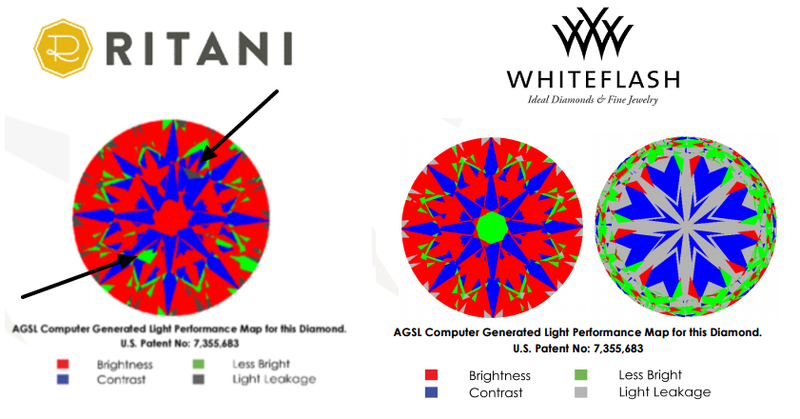 Ritani are a well respected jewelers so we felt that the best company to compare them to is Whiteflash as they are one of the selected partners. The price of this stone is $6,247 or a Wire Price of $6,173. The price of this diamond is $6,475 or a wire price of $6,281 – a difference of $288 and $108 on the wire price as Whiteflash offer a larger discount – however this is merely the beginning. A well cut diamond like the one on the right shows extensive red, a small amount of green, symetrical blue and only small amounts of leakage. The Ritani diamond shows leakage and a lack of symetry. In addition the Ritani Diamond shows an extra facet which is something that Whiteflash do not allow as it wouldn’t be classified as a perfect cut. 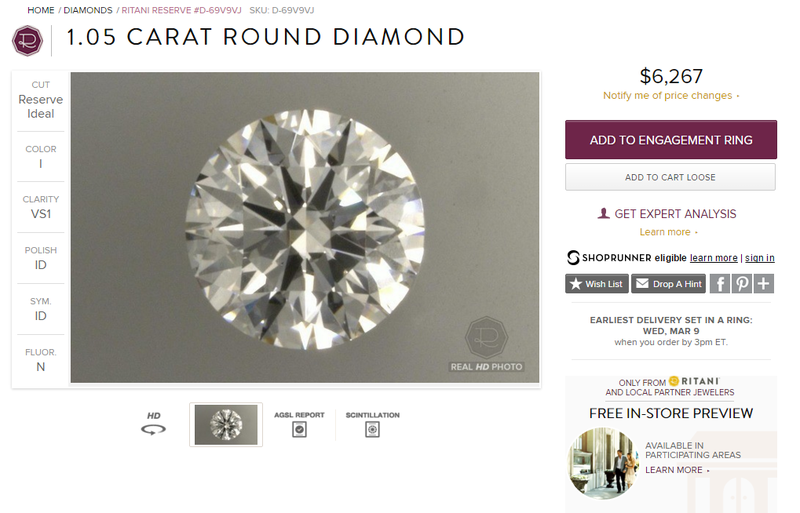 So whilst you would be saving money by using Ritani, the cut of the diamond is not as high. I would recommend sourcing a diamond from a specialist like Whiteflash as Super Ideal Cut Diamonds are something that they specialise in. It is also important to note that Whiteflash is an authorized seller of Ritani Settings so you can purchase both an ideal cut diamond and beautiful Ritani setting there. Ritani was founded back in 1999 by Harout Aghjayan,the brother of famous jewelry designer Vatche Aghjayan. The company is currently run by Brian Watkins who used to work at Blue Nile as an executive. During the 16 years they have been operating they have, from their New York and Seattle bases, risen through the ranks and established themselves as a major player in the jewelry industry. What sets them apart from many of their competitors is the way they seamlessly integrate their physical and online operations. They have a nationwide network of curated partners and these are the backbone of their unique approach to retailing. The so called “clicks and bricks’ allows you to order online then go and see your ring in one of their authorized store. As they cover the entire US you are guaranteed there will be one near you. Their success shows no sign of abating and in 2014 Forbes named them as one of their top 40 most promising companies. Design a Perfect Ring She’ll Love here. Free FedEx and 30-Day Easy Returns. Ritani don’t sell anyone else’s diamonds. They ethically source diamonds and only put their name to them when they have undergone stringent inspection and been certified by GIA or AGS. As these are the two best respected gem laboratories in the world this is your assurance of quality. It’s important to mention their Ritani Reserve Diamonds as well. Available only in round or princess cut, they are Ritani’s highest precision cut diamonds to yield the maximum amount of sparkle. Ritani’s create your own ring feature is one of the best I’ve found. The settings cover all the most popular styles and when it comes to choosing your diamond the user friendly filters make it quick and easy to match the perfect stone with your setting. Every stone you buy from Ritani carries a certification from either AGS or GIA which allows you to buy in confidence every time. 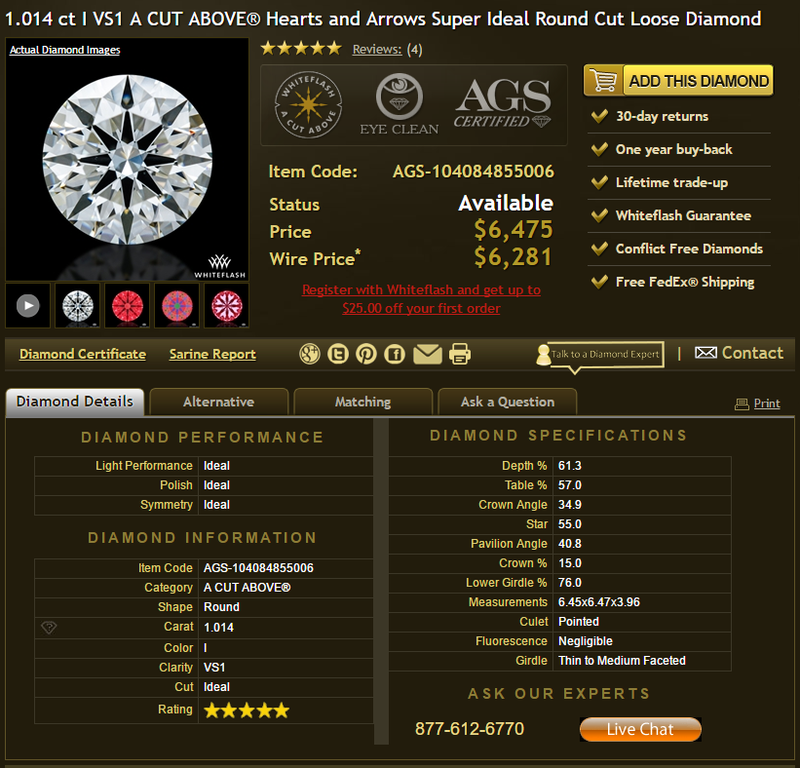 Many jewelry retailers promise to deliver quality at a great price and fail, yet Ritani really do practice what they don’t preach as this isn’t just a part of their marketing blurb. . That said James Allen and Whiteflash still provide a higher quality and more precision cut diamond especially with James Allen’s True hearts diamonds and Whiteflash’s A Cut Above Diamonds. The layout of the homepage is clean and informative without being over the top or crass. I particularly like the balance of text and imagery which gets the message across in a succinct way without going for the hard sell. There are only 5 tabs on the homepage which adds to the aesthetic appeal and my first impression was a very good one. This is not a selection of loose diamonds for sale however, it’s another way of getting to their create your own ring feature where you choose the stone first as opposed to the setting, The super easy filters allow you to easily narrow down the field if you know the caliber of stone you are looking for. If you don’t then a trip to the Education Section is in order. This is one of the best sections of this kind we’ve come across as you get to choose what you want to know about rather than scrolling through reams of text to find what you’re looking for. Everything is covered here from how to choose the perfect engagement ring to the latest trends in metals and, of course, the all conquering 4 C’s. You won’t be a diamond expert when you have finished reading this section but you will know a lot more than you did and be able to make an informed choice when it comes to buying your ring. And that’s what it’s all about when you are diamond shopping online. There are no ready-made diamond engagements rings on offer at Ritani. Creating your own is way more personal as you are effectively designing a unique ring for that special lady. By clicking on the Engagement Ring tab you are taken to the create your own section where you choose your setting first. The Wedding Rings and Jewelry sections are as exciting as the engagement rings and the latter also cover collections that have been exclusively designed for Ritani. All in all I was very impressed with all that this website had to offer and the fact that there is a large selection which manages not to be overwhelming. My first small complaint came in the imagery on the Ritani site. While some the images of the diamonds are of such a high quality they positively dance on the screen, some of the others are best described as lackluster. There is a stock pile of a few images that keep appearing on various pages as well as the home page and I got tired of them pretty quickly, however overall they are of a high standard. I thoroughly enjoyed my time on the Ritani site. Everything was easy to find, the navigation was quick and seamless and the create a ring section was one of the simplest you will find anywhere. The checkout was incredibly smooth and I love the fact that once you get the price for your ring, that’s all you pay. There are none of those annoying extras which pop up at the very end. I valued the fact that I could go and preview my ring in a store and they told me which was the nearest to my home. I cannot fault Ritani at all on their shopping experience and they are one of the few companies who have managed to replicate their physical shopping to their online presence. All the essentials are here and some interesting additions that I haven’t found on other sites. My particular favorite was the section on the latest diamond trends. This is a really useful for those who really don’t know their princess cuts from their asschers and helps them make a great choice that any girl would be proud to wear. They don’t just tell you to buy this stone or that stone either, there is plenty of interesting info to take a lot of the worry out of buying such an important ring. You can also read about the fine details in what makes a diamond so special, read about the company’s ethical sourcing methods and what that all important certification actually means to you. How do you describe a choice that is huge but not too huge? Ample isn’t a good enough a word, neither is sufficient. You have a wealth of different settings and metals to choose from and the perfect stone is only a few clicks away. Everything that you are told to look for when choosing a diamond can be found on sale, greatly simplifying what is, for some, a pretty daunting process. A very classy ring demands very classy packaging, and Ritani tick nearly all the boxes where there’s concerned. With the classic snap top that goes perfectly with the grand down on one knee gesture, these leather look gift boxes open up to reveal that sparkler nestling against gray satin. I know I’m nit picking but I personally think a darker color, such as navy, would make the stone really pop. The contrast of the sparkle against the dark background would definitely give that once in a lifetime experience an extra dose of wow factor. Every Ritani purchase is covered by their 30 days returns policy. You can return an item at any time within this deadline completely free of charge. The item will be collected from your door and taken back to the company. Once it has been checked, as you would expect, you will receive a full refund. There is nothing knocked off for restocking. Ritani is a high-end jewelry brand modernizing the way people purchase diamond engagement rings and jewelry. So why not 5 stars? To get the perfect score you have to offer perfection and Ritani don’t quite pull it off. If more products had dedicated high quality images and the interior of their gift boxes was improved then I would be closer to giving it 5 stars. In addition the quality of their diamonds means I am more likely to head to either James Allen or Whiteflash.